A game of eight-ball opens with a break shot, the cue ball sent straight into the arranged fifteen other balls, leaving them scattered on the table. Should this opening shot sink a ball, sides are decided, one stripes, one solids; when no ball is pocketed, the table remains open. The indeterminacy of this “open table” lends itself as an apt parallel for the way in which Lara Mimosa Montes approaches the page throughout her book The Somnambulist (Horse Less Press). A collection made up of two sections/sequences, The Somnambulist braids the narratives of a father, an uncle, and the poet across lyric fragments, maps, manipulated texts, and one photograph. Similar to a game of eight-ball where no balls are pocketed—where shots are made but the “game” never begins in a traditional sense—this collection’s multivalent approach subverts readers’ expectations of what poetry can be. Rather than a series of titled poems, poetry happens on every page of this book in an open-ended, yet intimate fashion. I say open-ended because the words hang, title-less; I say intimate because of the way in which the reader is invited to pick up the words and engage with them. The two sequences here hold together through the voice carried across fragments of verse and prose. Montes’s poetic sensibility is such that, rather than feeling scattered, the book holds together in a way that reads like a mix of gossip, memoir, and interrogation. In this spirit of braided open-endedness and intimacy, I have arranged my thoughts on and reactions to The Somnambulist across the following fifteen moments from the text. Consider these thoughts arranged like a game of eight-ball after the break shot where nothing has been pocketed. The pool analogy stems from the narrative of the uncle, whose role as a hustler parallels the role of a poet for the speaker in the book. My aim is to have my thoughts parallel the excerpts in a like manner, with the review being another open table where what matters is not any grand point being made or “pocketed.” Instead, the back-and-forth between reader and text is the focus, the reading experience as a game without scores, whose play and movement are trajectories into poetry. 1. The father feeds her his melancholic disposition. She takes it. The opening lines of the book, a lyric break shot that opens the book and sets the tone. This opening is charged with two of the main themes of the book, namely, melancholy and family. With family especially, the speaker’s meditations engage with the idea of family as circumstances out of an individual’s hands, circumstances one has to “take” and be shaped by. 2. Death, Djuna Barnes said, is intimacy walking backward. 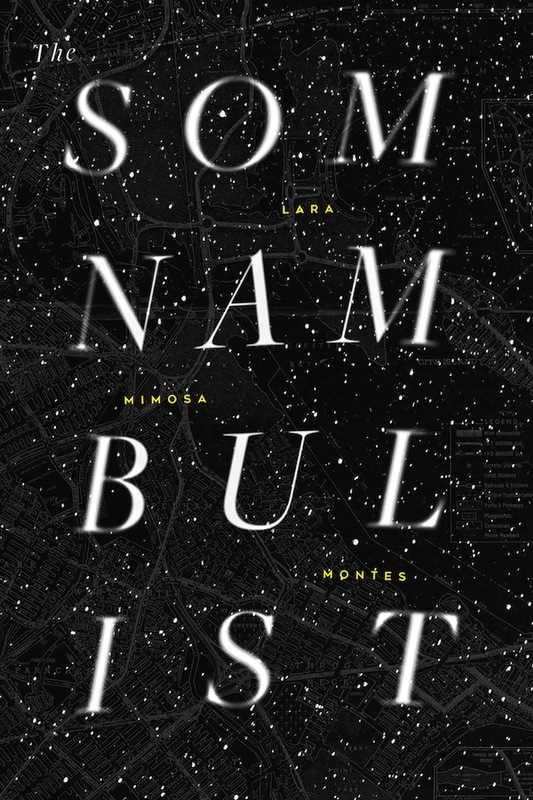 The Somnambulist is a reader’s book, able to draw in its references in such a way that the personal heat of reading and meaning-making colors the narrative. 3. How can one express neatly the prosody of a dream? The scansion of things. To each a rhythm unrequited. The stressed and the unstressed. The living and the dead dangling off a precipice, like a pronoun: He. In my dream, my father’s tormentors become blurred as their couplets fly off into the realm of honeyed language. They address Him. Sleep. The Somnambulist is a poet’s book, speaking in poet’s terms with a consistent awareness of those limitations. Never before in my reading have I read something that startled me down to my own sense of meaning-making, something that speaks to what poems (and language) can and cannot do. The last word here, “Sleep,” brings to mind the silence of the dead and of the blank page. Both page and dreams being spaces of recollection if not reconciliation. The Somnambulist is a conjurer’s book in reverse; that is, instead of spells mapped out in words, the speaker is consistently reaching after words, sensing that they point to another world and hold another power beyond themselves. Here again, the idea of power is implied, but not power as dominance, but power as deluge and allurement, as a threshold of presence. In this way, The Somnambulist is a guidebook on being present. What kind of person is she? What kind of poet? through anything. “Can she?,” you ask. She can. The curious logic here seeks truth. Like a performer sharing their secrets, the speaker in these lines practices the skill of speculation in order to show its place in the world of the book. Note how the final words, “She can,” answer the hypothetical question of “Can she?” by essentially holding up a mirror. Note, too, how objects in this lyric mirror seem as irrepressible as mercury. Again, the duality of sleep and life. But its logic is only pretend. Through its turns between confidant and counselor, The Somnambulist is an almanac for the weather and harvests one would wish for. Language redefined as “grief’s backwash” and placed here amidst advice, poetry “a last resort”—what else on the other side of somnambulism, that state of being where one is (not) sleeping and (not) resting and (not) being? The Somnambulist is a dictionary writing itself. inability to get it the poet’s problem? Considering the reader’s “inability to get it” a “poet’s problem”—as if the poet’s work was incomplete, as if they had not put everything before the reader that they could in order to have the poem be complete—The Somnambulist becomes a guide on how to read poems yet to be written. to place the missing junkie uncle. myself on a school bus, Willie waving as the bus leaves. From the same passage quoted in 9, note how many worlds there are: the world of Knight’s poem; the world of the speaker teaching Knight’s poem; the world of memory this moment opens up and takes the speaker to. Which world is real? If somnambulism consists of performing tasks while asleep that you don’t remember, The Somnambulist makes us aware that those same tasks happen during the day, and that the memory of them does nothing to make them tangible in the world of the present moment. These follow the speaker’s admission of not being able to divulge a secret and reckoning with what it costs. This coffin image not only evokes compartmentalization, but fleshes out its cause. How some secrets become too much, one can’t consider uncarrying them. 12. A poet meets a priest and plays the part of the bad penitent. This line comes from a passage where the speaker shares their response to their therapist proposing that they write plays. “I resent this question. I’m a poet. I don’t write plays,” the speaker says, but then shares that when they did, they got as far as the above byline. The phrase “bad penitent” rings out; the concept of one trying to make amends for wrongs but not meaning, not being able to fully show regret, because maybe they don’t, because maybe they shouldn’t. This indeterminate space—what dialogue for it? This moment, occurring within the framework of the speaker going to confession, echoes the “melancholic disposition” of the start of the book. That the scenario is a confessional adds depth to the priest’s startled reaction and statement on “melancholic / Catholicism.” That a poem can never be a confession, because a confession has an end, a penance, and absolution. The Somnambulist is poetry as memoir the way clouds make up the sky. 14. To be a poet is to lust for language by playing possum, playing dead. The pages of The Somnambulist hold their words in a similar silence, a silence that is only an act. In these, the last three words of the collection, one reads the speaker still reaching after meaning, driven by the ambition to recreate that is at the heart of lyric poetry. While the collection ends on these words, essentially an incomplete sentence, there is no dash to mark its incompleteness. Instead, the words hang as the reader hangs, suspended and alive in the fragmentary moment. José Angel Araguz is a CantoMundo fellow and the author of seven chapbooks as well as the collections Everything We Think We Hear, Small Fires, and Until We Are Level Again. His poems, prose, and reviews have appeared in Crab Creek Review, Prairie Schooner, The Windward Review, and The Bind. He runs the poetry blog The Friday Influence and teaches English and creative writing at Linfield College.